Welcome to the english page of our website. Here you will find a summary of our farm and Community Supported vision underpinning our work. On this one page you will find only a brief outline, but we are happy to deal with specific queries and welcome feedback as to ways we could improve on the information on this page. Kattendorfer Hof is a 435 hectare (1075 acre) Demeter farm in Schleswig-Holstein, northern Germany, about 40 minutes north of Hamburg. More than 50 people are involved in the care of the land and the animals, and the production and distribution of grain, vegetables, milk and meat products. The farm is run along the principles of Community Supported Agriculture. Community Supported Agriculture in practice means that we distribute what we produce to a set group of people. Anyone can become a member and receive a weekly share. By paying a monthly contribution to cover the running and development costs of the farm members can then collect their vegetables, meat and dairy products either from a self-managed coop or one of our own shops. Most of these are in and around Hamburg. 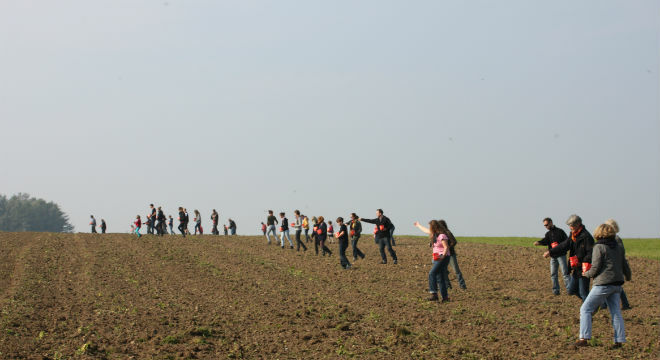 We are very probably the biggest CSA farm in Europe with over 700 individuals and families. 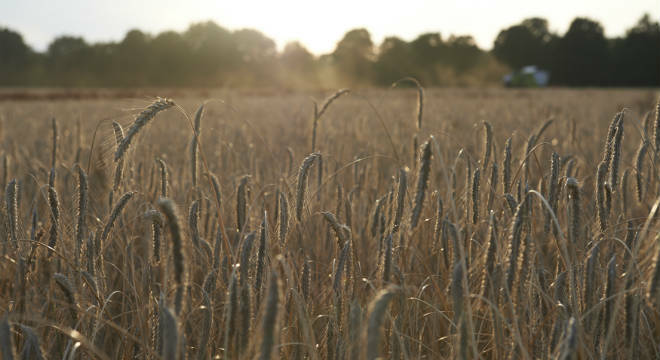 On the arable land we grow various types of grain. Rye and spelt are grown to provide a local Demeter bakery. Some of the bread baked there is then sold in our shops or distributed to the members. Members are also entitled to rye and spelt for their own baking needs. As part of the crop rotation other grains are grown to provide the feed that we need for the animals. Every few years a mixture of grass and clover is sown in order to provide the soil fertility for the grain. This is then harvested to provide winter feed for the cattle. Another important aspect for soil fertility and the production and maintenance of the humus content of the soil are the farm animals and their manure. 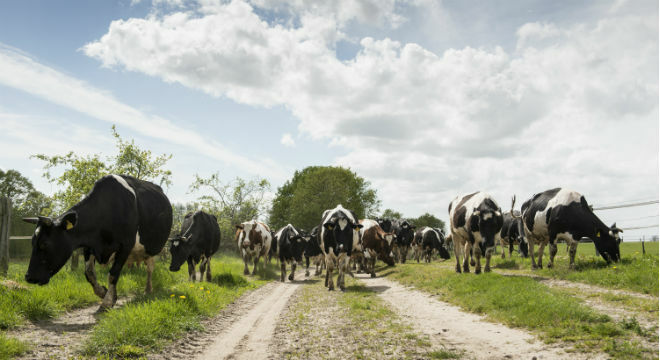 At the heart of the farm are the 50 dairy cows that also provide the milk that is processed in our own creamery into fifty different products: unpasteurized milk, yogurt, butter, soft cheeses and hard cheeses, among other products. The calves are all raised by a small suckler herd with some of the females destined as herd replacements, and the rest as grass-fed beef animals. 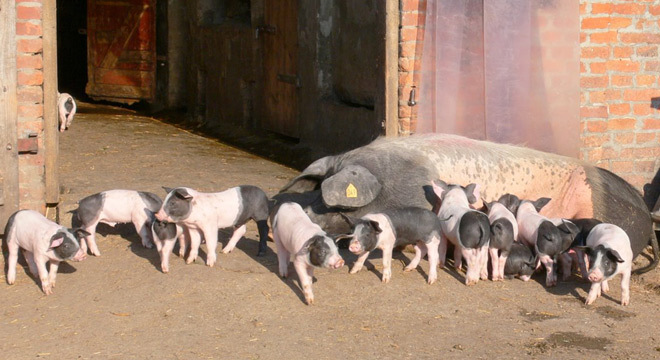 The pig herd consists of one boar, twelve sows and many piglets, runners and fatteners. Their primary purpose is to consume the vast amounts of whey that are a by-product of the cheese production, but of course their meat, along with the meat of the cattle and goats is also very much appreciated. The animals are slaughtered in a small family slaughterhouse and butchers nearby and processed into up to 50 different products which are also then distributed. On seven hectares of land potatoes and vegetables are rotated with green manures. Around fifty different varieties are grown in order to provide an all-year-round selection for the members. The share is seasonally dependent from variety and amount. In addition strawberries, rhubarb and apples are grown on the vegetable land. We also distribute apples, eggs and poultry from two other local Demeter farms and once a year olive oil and citrus fruits from a farm in southern Spain. For further details on our partners click here.